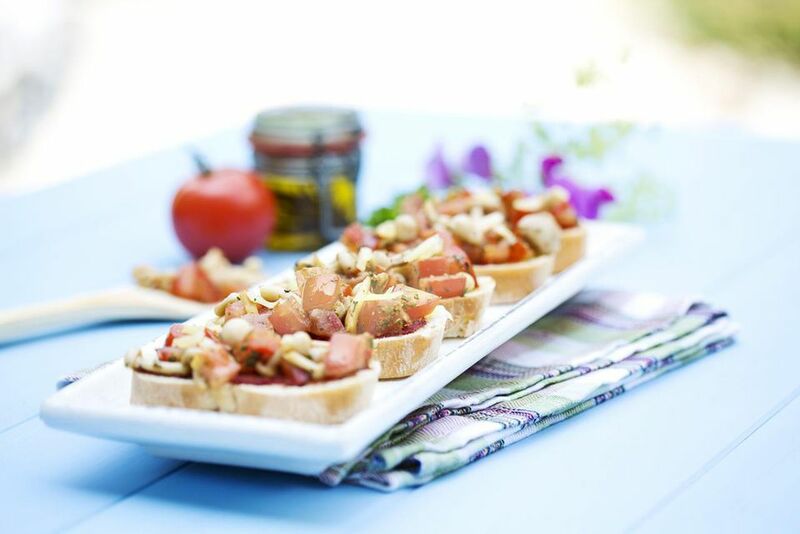 Bruschetta is a classic Italian snack of grilled bread drizzled with olive oil and rubbed with garlic (and sometimes a cut ripe tomato.) It's a simple, magical delight from which many variations have sprung, including this recipe which features lots of garlic, butter, and flavorful crabmeat. It may not be exactly orthodox, but it is wildly delicious! These buttery delights can be served as appetizers, snacks, or a luncheon dish (with a mitigating green salad). You don't need super expensive lump crab meat here (although it's fine if you want to) since the mixture is going to be spread out a bit. Less expensive grades will work just as well as long as they're light in color. On the other hand, it is important to use real butter and top-quality Parmesan cheese in this recipe. This is meant to be a rich, special occasion appetizer, so don't stint on flavor in order to save a few calories or fat grams. Savor the real thing instead. Serve with a crisp Prosecco or another dry, aromatic white wine. Melt the butter in a skillet over Medium-Low heat. Add the finely chopped garlic and saute for about 1-2 minutes. Gently fold in the crabmeat, the white pepper, and the parsley (Note: Don't add any extra salt.) Set aside. Sprinkle each with about 1 Tablespoon of freshly grated or shredded Parmigiano Reggiano cheese. Place the bread slices under the broiler or on the grill briefly, just until the cheese melts.